The hardest thing about fall cooking is finding the right balance of hearty and nutritious. Well, we think we cracked the code! Our new food blogger Ashleigh just gave us the low-down on this delicious bean soup, packed with yummy chicken sausage, healthy lentils and, of course, the Randall Beans you know and love. This soup is the perfect, guilt-free comfort food. 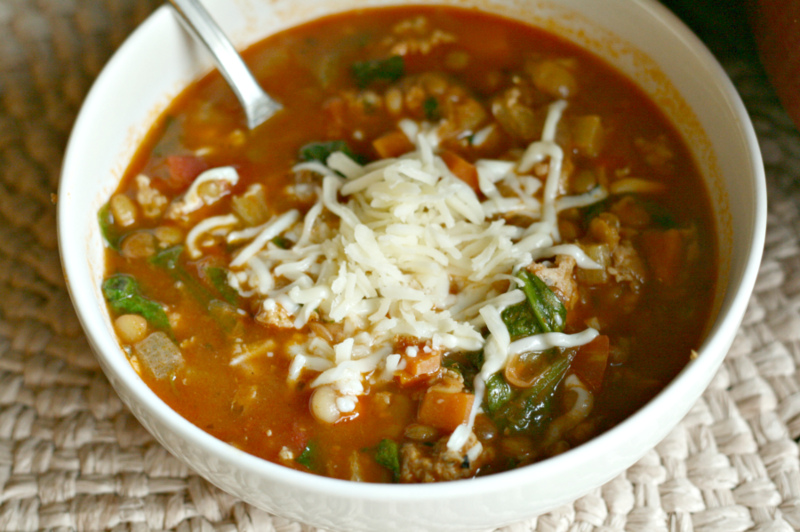 Packed with nutrients and protein, it’s sure to be your new cold weather favorite! Watch or follow along as Ashleigh demonstrates! In a large pot, heat EVOO over medium high heat. Add celery, carrots and onion. Cook 4-5 minutes, until starting to become translucent. Season with thyme and Italian seasoning. Add chicken sausage, crumbling with flat spatula as cooking. After 5 minutes, add minced garlic. Cook sausage until brown. Add tomato paste, lentils and beans. Stir to incorporate. Slowly pour in stock and diced tomatoes. Bubble on medium for 20 minutes, longer if you want! Right before serving, add chopped spinach. Stir. Serve with toasted bread and top with Italian cheese. Chicken sausage not your thing? Substitute any of your favorite Italian-style sausage – or make it vegetarian with extra beans! Want more great Fall recipes like this one? Check out our latest, free downloadable cookbook!